I've being doing a lot of long distance driving lately, which is a drag. The upside is that it gives me lots of time for listening to music. He's a few new things that have been getting repeat play in the Counting The Beatmobile. Steve Abel produced one of my favourite albums of 2006. Now he's just released his second, Flax Happy. Again Abel has produced an astoundingly good set of bittersweet folk ballads. He is joined by Anika Moa on one track and the great Texas blues/folk artist Jolie Holland on two. I love a sad song, and Abel is an expert at these - just check out the title of the two songs he does with Holland - 'Cinders of the Sun' and 'Heart of Misery'. You can hear Steve interviewed by Kim Hill on National Radio here (stream). And a video for an earlier song featured in the movie Woodenhead is on the video page. 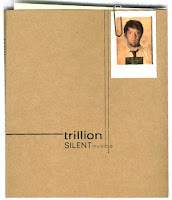 Trillion is the non-de-plume of hip-hop artist Jody Lloyd. Jody has been around for a while, with a few releases under his belt as Trillion and several more with earlier outfit Darktower. Lloyd produces hip-hop with a distinctly NZ accent. His later work with Trillion has moved on from the more classic kiwi vernacular of Darktower which some labelled as kiwiana. Lloyd's music now is still clearly of and about New Zealand, but that's not because he's invoking cliches but because his music reflects the viewpoints of a politically engaged New Zealander. The album Silent Invisible, tackles topical issues like the envionment and the war on Iraq but these aren't straight forward protest songs. Instead the lyrics come from the perspective of someone who wants to speak up but is fearful and aware of the ironic oppressive and anti-democratic actions of Western governments themselves reacting to threats to democracy. The album comes in an amazing package that looks like a government agent's folio of clippings and info on a suspect citizen, one Jody Lloyd. And while this is hip hop, it sure ain't P-Money or Mareko, although you probably could draw some parallels with the political hip-hop of Upper Hutt Posse. The video for his tribute to Edmund Hillary is on the video page.